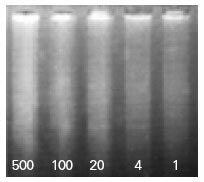 A universal method that performs global mRNA amplification, while maintaining the relative proportions comparable to the original sample is the Omni-ArrayTM mRNA amplification system. This system is compatible with all labeling and detection systems. Samples which were previously thought to be too small for microarray or other genome wide study can now be amplified using the Omni-ArrayTM mRNA amplification system. The Omni-ArrayTM mRNA amplification system provides a rapid and simple procedure for the generation of sufficient amounts of high quality sense or antisense strand RNA using nanogram quantities of starting RNA. The Omni-ArrayTM Amplification System is especially suited when the availability of total RNA becomes the limiting factor in performing certain experimental procedures. The system contains enough reagents for 5 two round or 10 single round amplifications. 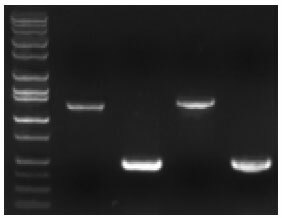 Consistent results are obtained with 100 ng total RNA for single round amplification and with 2 ng total RNA for two round amplification. 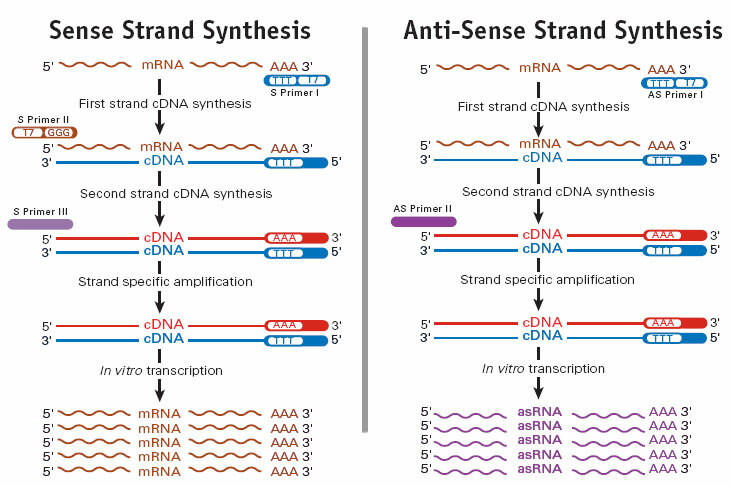 The final yield of mRNA is enough for labeling at least 2 microarrays. A single round of amplification results in 100-1000-fold amplification of the entire mRNA population from the sample. p53 cDNA amplification from human Omni-mRNATM pooled reference mRNA. Lane 1, mw markers; lanes 2 and 4, ~1.3 kb 5' end fragment of p53; lanes 3 and 5, ~500 bp of middle portion of p53. Lanes 2-3 and 4-5 represent reproducible different preps.